It makes sense now that the first movie ever filmed in Los Angeles was of nothing but traffic. The 30 seconds of shaky film, shot downtown on Spring Street in 1898, reveal the origin of an enduring issue for the city. L.A. is defined by its traffic, which is universally understood to move very, very slowly. 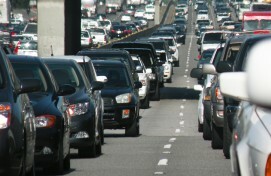 Today, drivers armed with smartphones use apps like Waze, darting on and off freeways to cut commute times by minutes. And this year, L.A. became the world’s first major city to synchronize all of its traffic lights. Yet in 2013, Angelenos still spent an average of 90 hours stuck in traffic. Could a recent infusion of $32 million for transit improvements in the city help recover this lost time? In advance of the Zócalo/Metro event “What Could Speed Up L.A. Traffic?”, we asked transportation experts the following question: What innovations have other cities implemented that could teach L.A. how to speed up traffic? When a bakery in the former Soviet Union opened in the morning, it gave bread to the first person in line, and then the next, until all the bread was gone. Everyone still in line had to wait for the next batch. This meant that if you were going to get your bread for breakfast, you had to get there early. So there were long lines for bread (like this one). We do something similar to allocate access to roads. The government builds roads and every morning, the people who want to use them line up. If you are early, there is lots of capacity for you, and you have a speedy trip. If you come a bit later, the capacity is all used up, and you need to wait for road capacity to become available (like cars on this on-ramp). The Soviet bakery had a line-up problem because bread was handed out free to the first in line. But what if we could price access to roads, just like we price access to bread today? If that were the case, queuing would no longer occur. In a number of cities around the world–London, Singapore, Stockholm, and even a few highways in L.A.–local authorities make drivers pay to access roads at peak times (but not at other times). In response to a peak hour toll, drivers rearrange their travel schedules. As a result, driving speeds increase and travel times decrease. By constructing a system of tolls, or prices, that are higher for congested roads and times than for uncongested roads and times, we can fix the traffic congestion problem. The price of reducing traffic congestion is pricing access to roads. Matthew Turner is professor in the department of economics at Brown University. His research focuses on the economics of land use and transportation. Current projects investigate the relationship between public transit and the growth of cities, whether and how smart growth type development affects individual driving behavior. Our streets are a limited resource, like water or energy. We can use this resource more efficiently by reducing the need for car trips or by making trips on modes that take up less space. To find a few tools that boost streets’ efficiency, Angelenos can follow the lead of the city of Santa Monica. Since 40 percent of trips in L.A. County are less than two miles, we know that there are opportunities to convert some vehicle trips to walking, biking, and active transportation. In Santa Monica, basic street restriping was able to convert excess lane width (without reducing car lanes) into over 40 miles of new bike facilities. In only two years, biking increased by over 50 percent. The best transportation plan is a good land use plan. Santa Monica is focusing housing and jobs near bus and rail networks, taking advantage of L.A. County’s historic streetcar routes and the walkable streets that grew from them. And Santa Monica is building strong first-mile/last-mile walking, biking, and transit connections to future Expo Light Rail stops. Private industry plays an important role too. New businesses, employers, and residential buildings can help sustain trip reduction strategies by providing commuter incentives, facilities for active commuters (like bicycle stations featuring showers and racks), transit pass subsidies, shared parking, and telecommuting options. These amenities reduce household transportation costs as well as demand on the transportation network. These strategies will provide a more holistic management of our street resources and “speed up traffic” by moving people in more ways, reducing the bottlenecks for everyone. Francie Stefan is the transportation & strategic planning manager for the city of Santa Monica, which has set a target of no net new trips for evening peak periods to support more sustainable street function, encourage wellness through active living, and reduce GHG emissions. Most people view parking meters as a necessary evil, or perhaps just evil. Meters can manage curb parking efficiently and provide public revenue, but they are a tough sell to voters. A new kind of meter, however, can change the politics of parking–and reduce traffic–by allowing cities to give price discounts for residents. In Miami Beach, residents pay only $1 an hour at meters in areas where nonresidents pay $1.75 an hour. Some British cities give the first half hour at meters free to residents. Annapolis, Maryland, and Monterey, California, give residents the first two hours free in municipal parking lots and garages. Pay-by-license-plate technology can automatically give discounts to all cars with license plates registered in a city. Cities link payment information to license plate numbers to show enforcement officers which cars have paid or not paid. Pay-by-plate meters are common in Europe, and several U.S. cities, including Pittsburgh, now use them. Like hotel taxes, parking meters with resident discounts can generate substantial local revenue without unduly burdening local voters. The price break for city plates should please merchants because it will give residents a new incentive to shop locally. In big cities, the discounts can be limited to each neighborhood’s residents. More shopping closer to home might then reduce total vehicle travel in the region. Parking meters with resident discounts come close to the most popular way to raise public revenue: tax foreigners living abroad. More money and less traffic will help any city. Donald Shoup is distinguished professor of urban planning at UCLA, where he has served as chair of the department of urban planning and director of the Institute of Transportation Studies. His book, The High Cost of Free Parking, explains how better parking policies can improve cities, the economy, and the environment. Each city has its own urban characteristics. The dimensions of the streets, the block size, the shapes of the lots, and the type of housing all differ depending on the city and its origins. North American cities are very different from Latin American cities, but they also have common features. From the mid-20th century, Americans in both the Northern and Southern hemispheres have left the core of the city and gone to the suburbs, which has caused car dependency and a crisis of mobility. In Bogotá, Colombia, we are working on research to create a mix between the current suburbs and human-scale neighborhoods that can be traversed by walking and bicycling. We are thinking of repurposing suburbs gradually, introducing commercial strips along the main roads within neighborhoods, using parking lots or streets to foster vibrant community life, and at the same time, moving people back to the old quarters of the city center. These ideas are easy to write about but difficult to implement. Reshaping cities demands political will and public conscience. But we also need new definitions of a city model based on a reimagined mobility system. Los Angeles has long been a traffic-clogged city, but given enough time and public support, the way people get around it could be transformed. Doris Tarchópulos is an architect, associate professor, and director of the master in urban and regional planning at the architecture school of Javeriana University. She has published several award-winning books and scientific articles on housing and urban planning.